Here’s an amazing set of images from the collection of Alan Weeks and Alan Fishel, who graciously provided them to share with all PE fans. At this time the PE / SP was negotiating with Jessie Haugh of the Metropolitan Coach Lines to sell all PE passenger service which took place within a few months. 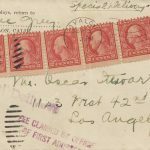 The Air Line was so out of site that it was not part of the original sale and was not included until well after the sale. PE was able to cut the line back to 10th Ave shortly after the publishing date on the time table, but was not abandoned It until October of 1953. Therefore the Air Line was the last line to have PE passenger service. This timetable was printed and distributed by rail enthusiast Norman K. Johnson. 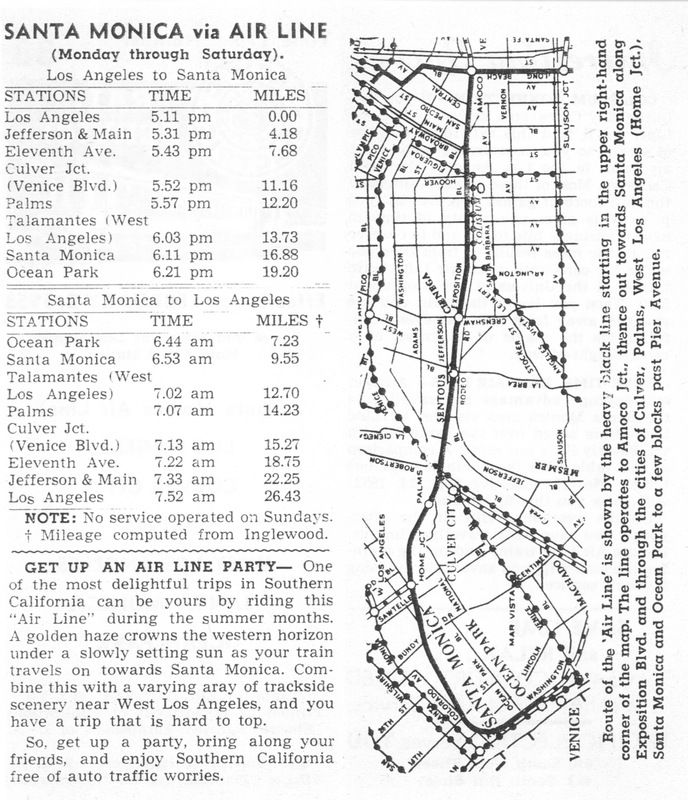 The Pacific Electric did not publish a timetable for the Air Line. It was a required franchise run and PE did not want it known about. The timetables were placed in the timetable rack at the PE 6th & Main Station and the PE removed them as soon as they were discovered. I remember the cienega stop being at west boulevard and exposition. Brilliant! In that era before Microsoft Word, I wonder how he duplicated PE’s typefaces and drawings. Greeting me and mom upon arrival in West Los Angeles was crossing over the grade separation at Overland and Santa Monica Boulevard in West Los Angeles, and seeing the overhead wire for two tracks but one recently pulled, leaving an endless series of shallow graves in both directions. Another memory was again in the back seat of the proto compact Dodge, when passing a grade separation for the West Los Angeles Veterans Administration. One rusted track (the overhead long gone) coming down to Wilshire Boulevard with track in the road, but missing in the vacant field on the other side, and conversely, a rusted track coming out of the weeds, and non existent of the Veterans Administration side. That track remained in service for a lumber yard, across from the Sawtelle Depot, formerly for the franchise that is mentioned in the P.E. article I read, and for years had signs warning that parking was only for P.E. Patrons. across from the Veteran’s Administrations for decades, kept painted, and even survived the construction of the nearby 405. I rode with my grandpa one night out of the Beverly Hills depot, for an overnight in his Los Angeles apartment. Grandpa urged me to sleep. I could not help myself and missed the ride, which I latter was able to review when enough P.E.material went On Line. I vaguely remember sleep walking out of the Subway terminal, waiting with grandpa in a safety zone, and boarding a narrow gauged car. The next day grandpa took me to a park a few blocks from where he lived an left me on a bench.The surrounding streets were a junction for P.E. cars, and for a good half hour I was in P.E. heaven; Pacific Electric postal and freight cars, elegant passenger cars, the kind from Oakland with the owl windows, a freight motor and narrow gauged cars. After that I was an enthusiast, if only at a distance. Another memory was sitting on the front lawn of a mansion on west Hollywood Boulevard, and looking down the street, and every so often a Hollywood Car (what else?) rumbled by noisily a few blocks down the street. Another memory, predating my ride with grandpa, clamoring for a trolley car ride in the back of the Dodge, and dad turning onto that same private and ALSO asphalt covered right of way for a few wonderful blocks. That right of way became a residential street for a short few blocks, the approach to Sunset Boulevard fenced off and overgrown with trees and shrubs. Also, when living close by (Fairfax near Santa Monica Boulevard)walking as close to the old right of way, and just below Sunset Boulevard, now a parking lot,some of the rail left in the ground was being removed (About 1998)and I was surprised at how small those rails were. the parking area for the residents had the tell tale shallow graves,wooden ties having been left in place and paved over having finally turned to balsa wood. I remember when arriving at the Union Depot with mom,there was a loop for the narrow gauged cars to pick up and drop off passengers. The M.T.A. used the paved over loop are for a few years, but recently a sidewalk was installed. I was able to ride the short lived M.T.A. 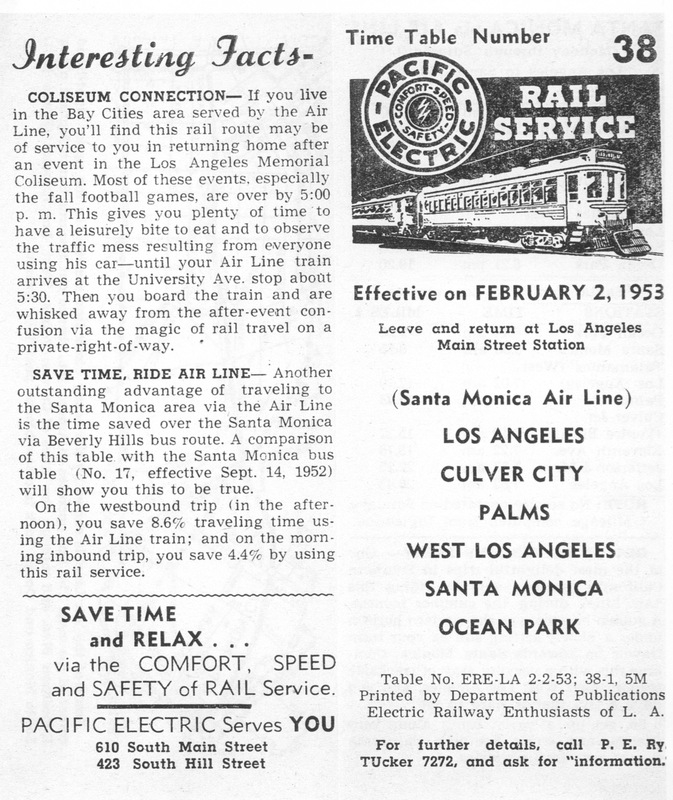 Los Angeles to Long Beach line weeks before abandonment (1961) and several decades later enjoyed a half dozen trips on the Blue Line! I may some day visit Los Angeles and ride on the rebuilt Exposition Line. I know from taking a tour prior to leaving Los Angeles, compliments of my friend Elliott Alper, that a trucking firm bought the right of way near where it veered of from what is now the Blue Line, and the rest of that segment is in gang territory.Creepy. The Expo Line now veers off the Blue Line further into downtown Los Angeles; I watched this being prepared, I think along Broadway. Finally, when the right of way in the middle of Santa Monica Boulevard in West Los Angeles was being bulldozed, some work was done on Santa Monica Boulevard west of Sepulveda Boulevard, and the P.E. tracks to the ocean, abandoned about the time I was born were unearthed, to be removed so palm trees could be planted. I saw a number of temporary unearthing of both P.E. and narrow gauged track in and around Los Angeles over the years as various boulevards were being resurfaced. In sum, I have a small library of memories connected to the Pacific Electric but up to the time I connected with you, little chance of sharing anything. I read a lot of books about the Pacific Electric and some of it’s predecessors to fill in many details; solve many small mysteries. Thank you, Charles! – Ed. So what happened to the Air Line right-of-way between Amoco tower and USC, which wasn’t used for the Expo line?